Wholesale Vinyl specializes in commercial grade vinyl fencing, also known as PVC fence. Easy to install, Vinyl Horse Fencing is especially effective at adding beauty to your property while keeping your horse safe. Our Horse Fence systems come in different styles and sizes featuring 2-rail, 3-rail, and 4-rail vinyl fences. This allows you to choose the style and height that works best for you. Whether you are trying to fence in livestock or want a beautiful property boundary we have the product for you. Although good horse fencing can be expensive, poor horse fencing can be a whole lot more expensive. That’s why we only offer commercial grade vinyl horse fence and we guarantee it will be the best price online. Wood fences rot and look terrible in a few years, barbwire is not attractive that is why vinyl is the best option. Vinyl fence for horses, cattle and property boundaries have pretty much taken over and for good reason. Vinyl horse fence looks better, work harder and last longer than wood fence and barbed wire fence of the past. You don’t have to paint, screw, repair or mend a vinyl horse fence. It will look great and last for years to come. Vinyl horse fence is being used successfully for cattle containment by some of our customers. Yes it’s true that cattle like to push nudge and shove when in confined areas which is why it is a good idea to run a hot wire but it’s in confined space or in the open pastures our vinyl horse fence are being used with great results! Vinyl fencing is also a good idea as a horse fence. When trouble comes, A horse’s instinct is to run. Having the correct type of horse fencing is important to keeping your horse and other livestock safe. Some advantages of using vinyl or PVC for your horse fence include being visible, so your horse won’t run into it without knowing it is there, it’s durable and long-lasting, and vinyl fencing is basically maintenance free. Unlike wood fencing, it will also give way without splintering, making it easier and safer to clean up and preventing further injuries for the horse. Get your Wholesale Vinyl Horse Fencing Today! Wholesale Vinyl provides premium vinyl horse fence to landowners. Our Wholesale fence company has established itself a reputation for high-quality products and services. With affordable, high-end horse fences, landowners can have the peace of mind knowing their property and animals are secure. Our horse fences are both attractive, sturdy and durable. 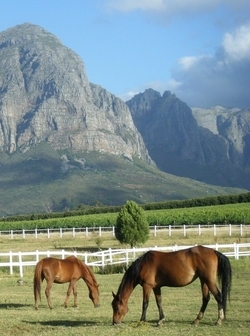 Secure your land and animals today with our exclusive wholesale vinyl horse fence.